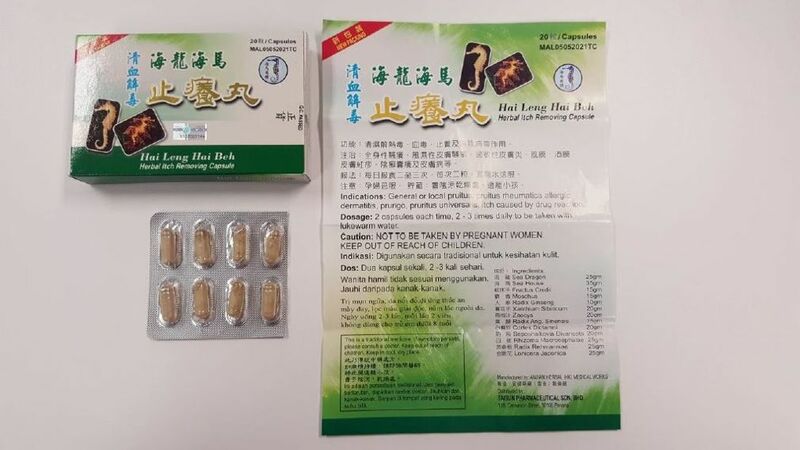 SINGAPORE: A health warning has been issued by Singapore authorities against an anti-itch herbal product after a woman who had taken the capsules developed Cushing’s syndrome, which causes rapid weight gain and a round “moon face”. The consumer, who is in her 40s, had taken the Hai Leng Hai Beh Herbal Itch Removing Capsule (海龙海马止痒丸) capsules to relieve an itchy skin condition, the Health Sciences Authority (HSA) said in an advisory on Thursday (May 5). Although the condition improved within a day of taking the capsules, she experienced rapid weight gain and her face became puffy after consuming the product for more than two months, HSA said. She was later diagnosed with Cushing’s syndrome, which is characterised by a round or “moon face”, and upper body obesity with thin limbs. The doctor reported the case to HSA. The product was found to contain undeclared "potent Western medicinal ingredients" dexamethasone, chlorpheniramine and paracetamol, although it was labelled “100% herbal”, HSA said. “Dexamethasone is a potent steroid that is usually prescribed for inflammatory conditions and should only be used under strict medical supervision. Long-term unsupervised use of oral steroids can cause Cushing’s syndrome, increased blood glucose levels leading to diabetes, high blood pressure, cataracts, muscular and bone disorders and an increased risk of infections,” it said. Although the consumer had purchased the product overseas, HSA warned that it does not rule out the possibility of the product being sold in Singapore. Any sellers in Singapore should immediately stop the sale and distribution of the product immediately, it said. Offenders may face a fine of up to S$10,000 and up to two years’ jail if convicted. Members of the public who have purchased or are consuming the capsules are advised to consult a doctor as soon as possible. They should not stop the use of the product immediately as the sudden discontinuation of steroids without proper medical supervision can cause withdrawal symptoms such as weakness, fatigue, confusion and low blood pressure, especially when it has been consumed for more than a few weeks, HSA said.